Whether you’re at home relaxing or on the go, the Linx V-range 12.2-inch 2-in-1 tablet is the ideal way to keep yourself entertained and productive. Featuring a ultra-fast processor, large 12 inch HD display, windows 10 home OS and free detachable keyboard. If you want a tablet that can easily transform into a laptop then the Linx V-Range tablet is for you. Whether you want a portable entertainment system for watching your favourite shows or a portable workstation for completing projects and tasks, the Linx V-range 2-in-1 is the perfect way to get the best of both worlds. 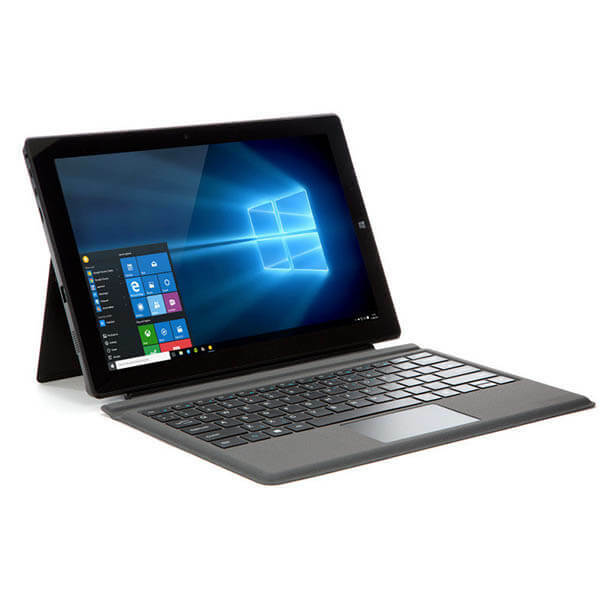 Featuring a complete version of Windows 10 Home edition, beautiful 12 inch HD screen, clip on keyboard cover and high performance processor, the Linx V-range 2-in-1 tablet delivers a range of functions for efficiency and enjoyment. Fitted with a large 12.2” IPS LCD display, the screen offers a Full HD 1920x1200 resolution with a pixel density of 185 pixels per inch. Thanks to the larger screen you’re able to get the best of both worlds, in terms of being able to complete work related tasks easily. The Full HD screen is a pleasure to the eyes, replicating colours with true-to-life quality and delivers vast amounts of details. Perfect for watching your favourite movies or even playing games. Powered by the Intel Atom X-5 chipset, the quad core processor delivers enormous amounts of processing power to the Linx 2-in-1 Tablet. You have a choice of two options, either with 32GB of internal memory with 2GB RAM or 64GB internal memory with 4GB RAM. The tablet is capable of running the most demanding applications, games and can run multiple windows at once. Performance is ultra-smooth without any noticeable lagging or drop in frame rates. The Linx Tablet is kept alive with its 10,000mAh Li-Ion battery, lasting approximately up to 8 hours. Ideal if you want a device that can keep you entertained on a long commute or a device that can work as hard as you do.